Recent Arrival! CARFAX One-Owner. 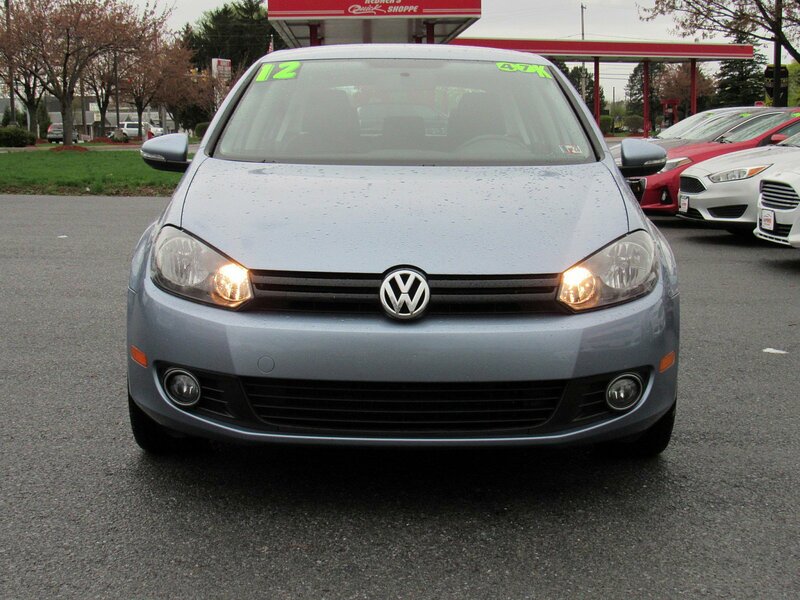 2012 Volkswagen Golf TDI 2.0L 4-Cylinder Diesel 6-Speed DSG Automatic with Tiptronic FWD BlueNon-Smoker, Remaining Factory Warranty, Alloy Wheels, Convenience Package, Cloth, 17 Salamanca Alloy Wheels, 4-Wheel Disc Brakes, 8 Speakers, ABS brakes, Air Conditioning, AM/FM radio: SiriusXM, Anti-whiplash front head restraints, Brake assist, Bumpers: body-color, CD player, Cloth Seating Surfaces, Compass, Driver door bin, Driver vanity mirror, Dual front impact airbags, Dual front side impact airbags, Electronic Stability Control, Four wheel independent suspension, Front anti-roll bar, Front Bucket Seats, Front Center Armrest, Front reading lights, Heated door mirrors, Heated front seats, Heated Front Sport Bucket Seats, Illuminated entry, Leather Shift Knob, Leather steering wheel, Low tire pressure warning, MP3 decoder, Occupant sensing airbag, Outside temperature display, Overhead airbag, Overhead console, Panic alarm, Passenger door bin, Passenger vanity mirror, Power door mirrors, Power driver seat, Power passenger seat, Power steering, Power windows, Radio: Premium VIII AM/FM w/In-Dash 6-Disc CD, Rear anti-roll bar, Rear reading lights, Rear seat center armrest, Rear window defroster, Rear window wiper, Remote keyless entry, Security system, Speed control, Speed-sensing steering, Split folding rear seat, Sport steering wheel, Steering wheel mounted audio controls, Tachometer, Telescoping steering wheel, Tilt steering wheel, Traction control, Trip computer, Turn signal indicator mirrors, Variably intermittent wipers.Odometer is 3316 miles below market average! 30/42 City/Highway MPGThank you for choosing AutoPROVED, where Cars Cost Less and home of No Haggle Pricing. All of our vehicles go through a RIGOROUS 118pt inspection and are FULLY SERVICED. Our reconditioning program makes your used car Look and Feel like new! SCHEDULE YOUR TEST DRIVE TODAY!Our Primary Focus is YOU! Providing a transparent experience to our clients is a top priority at AutoPROVED. Be sure to review our customer testimonials page and to get an idea of how the experience we provide sets us apart from any other dealership you will visit! We work with over 25 different financial institutions that cater to just about any financial circumstance!Awards:* Car and Driver 10 Best Cars * 2012 IIHS Top Safety PickCar and Driver, January 2017.